30 miles outside of Manhattan sits the city of Stamford Connecticut; home to one of the largest financial, and corporate centers in the United States. There’s GE Capital, NBC Sports, and Nestlé’s to name a few. Over there at 1241 East Main Street sits an international corporation with millions of dollars in assets, who last year had their product reach out to 36 million people in 150 countries. We’ll skip the guessing game; “no, it’s not the giant insurance company Geico….aaaarrhhhh! I said were skipping the guessing game. “That’s right, its WWE; World Wrestling Entertainment. Say whatever you want about wrestling; so much already is, but whatever you say, one of your comments should be that it’s HUGE! Not just money-wise but popular-wise, as in a fanatical base (fan being short for fanatical anyway). If that last comment makes no sense, think about it this way; money doesn’t necessarily make something “huge.” Take the IRS. They have tons of money going in and out, but they’re not exactly endeared to the public. When I was a kid, we knew about wrestling, but in our world, it hadn’t even begun to morph into the massive “show of shows” it is now. Because of this, I wasn’t surprise one year when as a “Big Brother,” my 8-year-old “Little Brother,” asked for a wrestling “action figure” for his birthday. Off to the store we went, and though I had no idea what to buy, I was sure by my little friend’s determined march, he knew exactly what he wanted. Instantly, he picked out the figure he dreamed about for so long. He then began to comb the shelves with his wide eyes. Not fully versed in the modern wrestling culture, I thought I still understood his concentration; but I only got it partially correct. What good is one action figure if “he” has nobody to wrestle?” I told my friend to pick out a second wrestler. A big smile appeared, and he immediately picked out a second action wrestler. Thinking we were done, because there was no way I was going to buy the 2’ x 2’ wrestling ring, I turned and started to walk slowly away. My friend was not “in tow.” I asked if he was coming along. He stood motionless with a sad look on his face. I asked what was wrong. He told me his toy was missing a part. I went back and examined the boxes. I was expecting a missing head or arm (after all, wrestling is a dangerous occupation). I told him everything looked in order. He began to repeat several times. “A piece is missing, a piece is missing; they won’t be able to wrestle right.” His voice began to crack, and he was obviously upset. I tried to reassure him that the toy would be fine, but I knew right away I wasn’t getting the gist of his dilemma. Not sure what to do, I began to look closely at the description on the boxes in his hand, until the light went off in my own head. The description said “spring loaded overhead arm action grip.” I started to laugh wildly. My friend gave me a horrified look. The only thing an 8-year-old kid hates more than troubled times in toy land is a publicly embarrassing adult. I turned and viewed the upper shelves finding a separate box that just had to be the missing piece he was in search of. I reached up, and took it down. I said “is this what you’re looking for?” His face lit up like the sun, and suddenly all was right in the world. In the box were 2 small replica folding metal table chairs. The toy chairs could be mounted in to one action figure’s hands so when you spring-loaded his arms above his head, he was ready, with a push of a button to “slam” the mini chair down on the head of the second action figure. 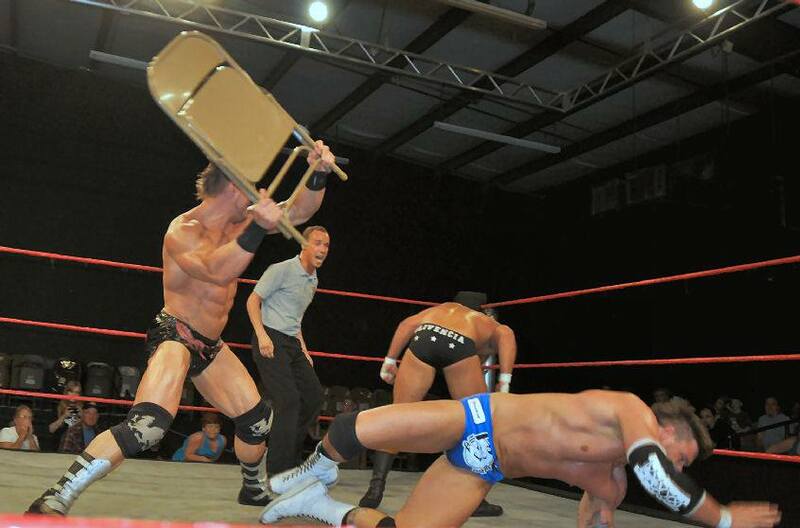 I have no idea how many people reading this already knew of the chair, but I’m always up for evolution. In subsequent years, if I ever had any regrets of promoting violence among the youth; as implausible as wrestling may seem, those regrets were quickly purged from my moral bank by recent “action figure” upheaval from Florida. Toys “R” Us acquiesced to a local petition to remove the TV show-inspired, Breaking Bad action figures from their stores, and online inventory. The figures are based on characters that illegally make, and sell the named drug Methamphetamine, commonly known as Meth. Toys “R” Us claimed the figurines were meant to be sold as adult toys. Oh really? Here’s a tip for T-R-U; if any of that B.S were true, you would have been selling that crap at Liquor Stores “R” Us! !